● The Expedia Price Guarantee ensures travelers get the best rates for combined hotel and flight bookings by offering a refund of the price difference, if a lower price for identical accommodations is found on the Expedia site or elsewhere within 48 hours of the order. If only a hotel is booked, travelers have until 48 hours before check-in to claim a refund. ● Visit the Deals page for travel bargains on cheap flights, holiday package deals and discount car rentals. Seasonal sales promotions offer discounts as high as 40% off on Flight and Hotel packages, or just hotel accommodations. ● The Active Coupons, Voucher and Discount Codes page features current promotions offering discounts as high as 10% off hotel accommodations or up to £350 off vacation packages. ● Expedia UK offers a rewards program through its partner Nectar. Nectar Points can be earned for flight, hotel, car rental or vacation package bookings, which are redeemable for cash reward vouchers, which can be used at Expedia UK or other partner establishments. ● Save more on holiday expenses by booking flights and hotels together, instead of standalone reservations. If you're planning a vacation in the near future you will want to know about flights, hotels, cars, and vacation packages that can help you to get the best price for your travels. 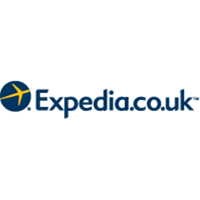 expedia.co.uk is an online resource that travelers can use to find different elements of their vacation at the “lowest prices on the internet”. You can also take advantage of their online information such as things to do in different areas around the world, how to get the best deals, and if there are any last minute vacation packages available for you to take advantage of. For most up to date offers check out Expedia UK on Facebook and Twitter or contact Expedia UK Support for any questions.